These three companies are riding the epic whitecaps of e-commerce. Surf's up! In surfing, a point break is a wave that results when the swell hits a rock, creating a long-lasting and extremely rideable wave -- one of the best and most sought after in the surfing world. For investors, retail is that rock, and e-commerce is the point break. E-commerce is one of the biggest trends in the world, and it shows no signs of slowing. It is expected to total $1.9 trillion -- 8.7% of all retail sales -- for 2016. That figure will likely double to more than $4 trillion and nearly 15% of all retail sales by 2020. This presents investors with numerous ways to hang ten and ride this wave of explosive growth. Let's look at three of those. In Latin American e-commerce, MercadoLibre (NASDAQ:MELI) is the peak. The company connects buyers and sellers in a variety of ways and takes a piece of each transaction. This includes an auction platform, standard e-commerce platform, and its payment solution (MercadoPago) and shipping platform (MercadoEnvios), which are experiencing explosive growth. MercadoLibre is the most popular e-commerce site in Latin America based on number of unique visitors. It generates more than 97% of its revenue in the 18 Latin American markets it serves. Demographic trends in Latin America still represent a huge opportunity for MercadoLibre. The region has a growing middle class and lower smartphone and internet penetration rates; e-commerce is in its infancy there. Online sales in Latin America represent just 2.2% of total retail sales, versus 8.7% for its global counterparts. MercadoLibre has shown phenomenal growth over the last five years. It has seen its user base increase an average of 22% in each of the last five years, items sold an average of 26%, and payment transactions an average of 62%. Revenue has grown 70% on average in each of the last four quarters. 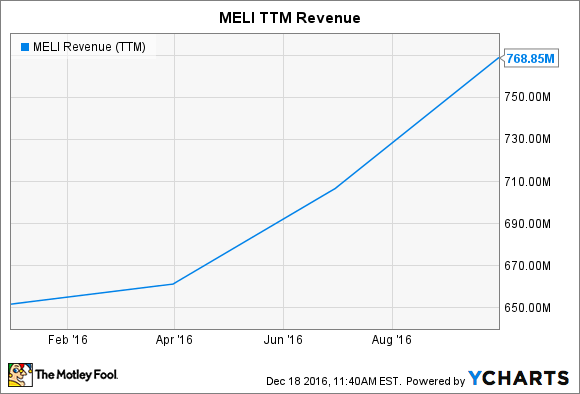 MELI Revenue (TTM) data by YCharts. Investors would do well to paddle out and ride this totally gnarly tube of e-commerce growth. Pick and shovel businesses -- companies that give others the tools required for the job -- are another way to play this e-commerce endless summer. There might be no better candidate than a leader in providing e-commerce platforms to small- and medium-sized businesses? The one solution that repeatedly appears on many "most recommended" lists is Shopify (NYSE:SHOP). Shopify is an e-commerce and payment platform known for its ease of use, be it on desktop, mobile, or social media. It helps customers make sales, process payments, and monitor inventory. It also provides help with search engine optimization and business analytics. And it provides business owners with more than 1,000 apps that let them customize the experience for their shoppers. In all, it provides essentially a one-stop shop for e-commerce that allows business owners to focus on their business. It does this for a monthly fee and a piece of each transaction. 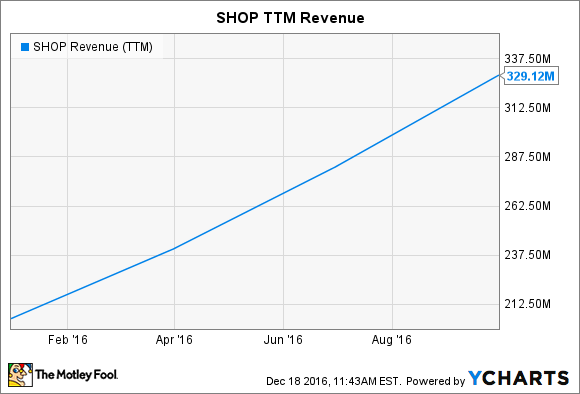 SHOP Revenue (TTM) data by YCharts. Business has been booming. Shopify has grown revenue 94% on average in each of the last four quarters, while gross merchandise volume has grown in excess of 100%, and monthly recurring revenue over 70%. With an installed base of more than 325,000 merchants currently in its network and growing, this is one tube you want to catch. No discussion of e-commerce would be complete without the global top dog, the Big Kahuna. Amazon.com (NASDAQ:AMZN) is the largest e-commerce retailer in the world. In fact, Amazon is the world's eighth largest retailer. 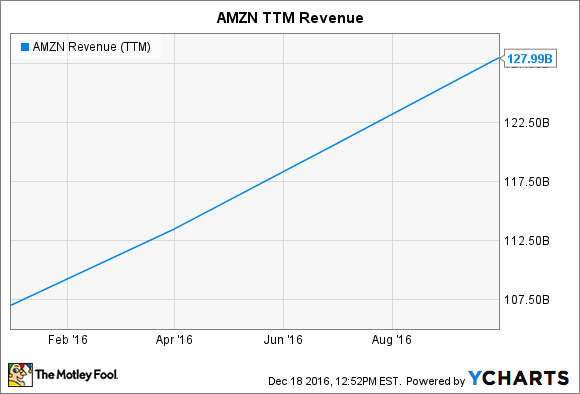 This is a business where scale matters, and nobody has more scale than Amazon. From its modest beginnings as an online bookstore in 1995, Amazon has become the global e-commerce powerhouse. Not satisfied to dominate e-commerce, it has expanded into web and cloud services, video and music streaming, and groceries, and it's building out a global logistics and delivery business. Amazon produced $32.7 billion in sales in its most recent quarter, up 29%. It expects fourth-quarter sales to grow between 17% and 27% over the prior year to between $42 billion and $45.5 billion. Revenue has increased 28% on average in each of the last four quarters. From a global e-commerce standpoint, however, Amazon has just scratched the surface. Revenue from product sales exceeded $79 billion for 2015. This represents only 5% of the total global e-commerce market. As Amazon continues to expand internationally and add product categories and services, the potential for additional growth is epic, dude! Worldwide, e-commerce is still in its early days -- remember, the internet was only open to commercial use in the early 1990s. This trend is a point break and still has a long pipeline, and these three picks are riding the wave. Surf's up!